Patients with arthritis of the hand present with pain, restricted mobility, and deformity. The underlying pathologic processes are distinguished on the basis of the history of disease onset and progression, distribution of joint involvement (monoarticular versus polyarticular), extraarticular manifestations, and review of serologic markers. The arthritic interphalangeal (IP) joint demonstrates fusiform joint swelling. With progression of the condition, marginal osteophytes (Bouchard nodes) become evident with progressive lateral deviation of the digits, as shown below. Radiograph depicting the clinical picture of a hand with fusiform swelling at the proximal interphalangeal joints. These are called Bouchard nodes. The proximal interphalangeal (PIP) joint is a ginglymus joint, or hinged joint, with a functional stability throughout its normal arc of flexion and extension. This bicondylar joint comprises a pair of concentric condyles that are separated by the intercondylar notch and allows a range of motion of 90-120°. The two corresponding articular surfaces of the middle phalanx are separated by a median ridge. In contrast to the metacarpal articular head, the center of rotation of the phalangeal head remains constant throughout flexion and extension. This phalangeal joint configuration provides functional stability for lateral and rotatory forces. The oblique collateral ligaments arise from the dorsal and lateral aspect of each condyle to insert into the lateral tubercle, near the volar margin of the middle phalanx base. These collateral ligaments are 2-3 mm thick. The volar plate consists of a distal portion of a thick fibrocartilaginous tissue that inserts into the volar lip of the middle phalanx base and is suspended by the transversely oriented accessory collateral ligaments. The proximal aspect of the volar plate is membranous and is attached to the neck of the proximal phalanx. The lateral portion of the volar plate thickens to form the volar check ligaments. See the volar view of a finger below. Schematic volar view of a finger. Note that between A3 and C1 is the volar plate. The lateral extension represents the restraining triangular ligaments. A2, A3, A4 = annular pulleys 2-4; C1 = cruciform pulley 1; Cl.lig. = Cleland ligament; d.a. = digital artery; m.p. = middle phalanx; p.p. = proximal phalanx; and p.t.d.a. = transverse digital artery. Additional stability is provided to the PIP joint by the extensor aponeurosis on the dorsal surface of the digit. The central slip of the extensor digitorum communis tendon attaches to the dorsal lip of the middle phalanx. The oblique retinacular ligament arises from the side of the proximal phalanx and passes laterally into the PIP joint to join the lateral margin of the extensor band on the dorsal lateral aspect of the middle phalanx. The transverse retinacular ligament is superficial and runs dorsally from the volar surface of the capsule and flexor tendon sheath; it is attached to the lateral margin of the lateral tendon of the extensor mechanism. The Cleland ligament is dorsal to the neurovascular bundle, and the transverse Grayson ligament is volar to the neurovascular bundle, as shown below. 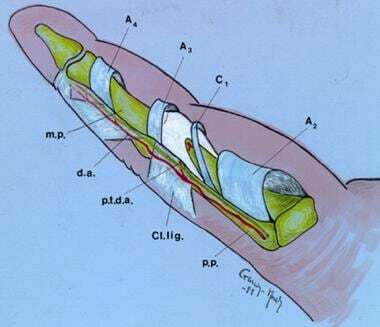 Cross-section of a finger at the proximal interphalangeal (PIP) joint level. The Cleland ligament is dorsal to the neurovascular bundle (n.v.b. 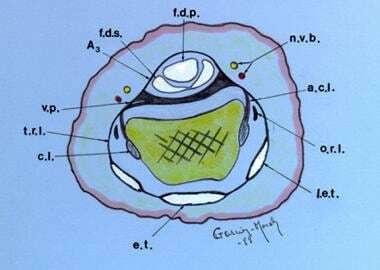 ), and the transverse Grayson ligament is volar to the neurovascular bundle. A3 = annular pulley 3; a.c.l. = accessory collateral ligament; c.l. = collateral ligament; e.t. = extensor tendon; f.d.p. = flexor digitorum profundus; f.d.s. = flexor digitorum superficialis; l.e.t. = lateral band; o.r.l. = oblique retinacular ligament; t.r.l. = transverse retinacular ligament; and v.p. = volar plate. The distal interphalangeal (DIP) joint is also a hinge, or ginglymus, joint. A capsule surrounding the DIP joint is reinforced laterally by collateral ligaments that insert into the sides of the head of the middle phalanx and run in a distal and volar direction to insert into the volar lateral tubercle of the distal phalanx. Operative treatment is indicated for the arthritic interphalangeal joint when medical management has failed to relieve the pain, when the digit deformity is interfering with hand function, or when a significant restriction of motion limits the activities of daily living. Working closely with certified hand therapists in the preoperative and postoperative periods is necessary to ensure the best outcomes. Stability considerations are as important as motion considerations, especially in the radial digits that are involved during pinching activities. During pinching, the index finger must withstand forceful contact with the thumb, especially in the lateral or key pinch. Patients with impaired index fingers pinch with the middle finger when possible, so stability of the middle finger becomes more important when the index finger is also affected. Relatively few surgical options exist for the painful arthritic PIP joint. Currently, PIP joint osteoarthritis is typically treated with arthrodesis of the index finger and silicone arthroplasties in the ulnar digits. A Swanson interpositional arthroplasty of the PIP joint through a dorsal approach has been recommended. The volar approach, however, has better cosmetic and functional results. This approach provides an excellent exposure, which is critical given the importance of the technique with this type of procedure. However, with the volar approach, the risk of creating a swan-neck deformity exists. A shortcoming of the Swanson implant is the sacrifice of the collateral ligaments, which makes implantation of the device in the PIP of the index or long finger undesirable. In contrast, the collateral ligaments are spared with implantation of most surface replacement arthroplasties (SRAs) of the PIP joint. In the volar arthroplasty approach (see below), a radial- or ulnar-based Bruner incision is made, with the apex at the PIP joint flexion crease. After the skin flap is elevated, the Grayson ligaments are completely released from their origin, exposing the neurovascular bundle. The bundle is then retracted, exposing the Cleland ligaments dorsally, which are also released. Surgical picture of the volar approach for an arthroplasty. This image depicts the flexor tendons, retracted to the side, and the volar plate. The proximal and interphalangeal transverse digital arteries, which are consistently present as communicating branches from the digital arteries, are cauterized and transected, allowing full mobilization of the neurovascular structures. The flexor tendon sheath is released by dividing the origin of the first and second cruciform pulleys and the third annular pulley at the volar plate. The volar plate is fully exposed and is released proximally and along its lateral margins from the accessory collateral ligaments, which are seen upon release of the transverse retinacular ligament from the volar capsule and tendon sheath. The collateral ligaments are then released proximally, and the joint is opened by hyperextension, as shown below. The flexor tendons retract to one side, and the neurovascular bundles are displaced dorsally. Both articular surfaces are completely exposed in this manner. The proximal interphalangeal joint in hyperextension. Note the marked degenerative changes of the articular joint surface. The medullary cavities of the bone are reamed in order to accommodate the proper size of the implant (see the images below). At this time, the authors use the recommended radiographic examination in order to assess adequate space and alignment of the digit. After the implant is inserted, it is essential for the surgeon to confirm that the digit has full range of motion and the implant is stable. The medullary cavities of the phalanges are prepared for placement of an implant of the proper size. After the medullary cavities of the phalanges are prepared, an implant of the proper size is placed. Resurfacing prosthetic procedures, with or without bone cement, have been designed for replacement of the PIP joint. Limited experience with this design has shown promise for future consideration as an alternative treatment. The exposure for most surface replacement arthroplasties spares the collateral ligaments; therefore, these joint replacements are an option for the index and long fingers. An alternative treatment for interphalangeal joint osteoarthritis is arthrodesis of the joint in a functional position. Arthrodesis offers stability, durability, and little need for further procedures. This option is the procedure of choice for the index finger, which is usually subjected to lateral stress during pinching activities. Arthrodesis is indicated mainly for the index and middle fingers in patients who are young or active or when a significant loss of bone has occurred, and this procedure continues to be the best surgical treatment for the painful, unstable proximal interphalangeal (PIP) joint in the index or long finger. However, depending on the patient's needs, arthrodesis may impair or even be incompatible with satisfactory function. Several different arthrodesis techniques for the PIP joint exist, based on the type of fixation that is used. The appropriate finger position varies for the radial to the ulnar fingers and with the assessment of the patient's particular needs. Kirschner wires (K-wires), interosseous wiring, tension band wiring, and screw fixation have been used to achieve a solid, painless arthrodesis. [11, 12, 13, 14] The rate of non-union is 0-10%. Primary wound healing is the first goal of postoperative care. Elevation of the affected digit is important to prevent swelling. Active motion of the PIP joint usually begins on the third to seventh day, as the swelling subsides. 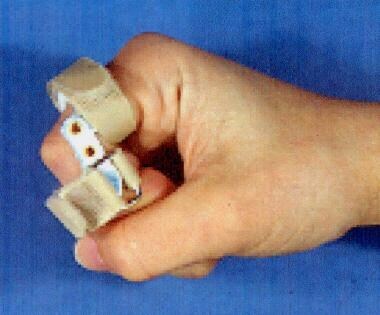 Following arthrodesis surgery, the PIP joint is protected in a dorsal and volar Orthoplast splint for approximately 4-6 weeks (see the image below). Motion of the metacarpophalangeal and DIP joints is allowed shortly after surgery. A hand therapist evaluates the patient to ensure adequate splinting, joint protection, and assistive devices to carry out the activities of daily living. After the initial postoperative swelling subsides, the patient may wear a splint to control the lateral deviation of the digit and to encourage active range of motion. Watt AJ, Shin AY, Vedder NB, Chang J. Joint arthritis and soft-tissue problems of the hand. Plast Reconstr Surg. 2010 Dec. 126 (6):288e-300e. [Medline]. Kuczynski K. The proximal interphalangeal joint. Anatomy and causes of stiffness in the fingers. J Bone Joint Surg Br. 1968 Aug. 50 (3):656-63. [Medline]. [Full Text]. Wolfe SW, Pederson WC, Hotchkiss RN, Kozin SH, Cohen MS. Green’s Operative Hand Surgery: Expert Consult: Online and Print. Elsevier Health Sciences; 2010. [Full Text]. Kahlenberg JM, Fox DA. Advances in the medical treatment of rheumatoid arthritis. Hand Clin. 2011 Feb. 27 (1):11-20. [Medline]. Canale ST, Beaty JH. Campbell’s Operative Orthopaedics: Expert Consult Premium Edition-Enhanced Online Features. Elsevier Health Sciences; 2012. [Full Text]. 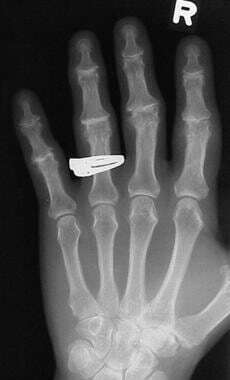 El-Hadidi S, Al-Kdah H. Distal interphalangeal joint arthrodesis with Herbert screw. Hand Surg. 2003 Jul. 8 (1):21-4. [Medline]. Swanson AB, Maupin BK, Gajjar NV, Swanson GD. Flexible implant arthroplasty in the proximal interphalangeal joint of the hand. J Hand Surg Am. 1985 Nov. 10 (6 Pt 1):796-805. [Medline]. Linscheid RL, Murray PM, Vidal MA, Beckenbaugh RD. Development of a surface replacement arthroplasty for proximal interphalangeal joints. J Hand Surg Am. 1997 Mar. 22(2):286-98. [Medline]. Burton RI, Campolattaro RM, Ronchetti PJ. Volar plate arthroplasty for osteoarthritis of the proximal interphalangeal joint: a preliminary report. J Hand Surg Am. 2002 Nov. 27 (6):1065-72. [Medline]. Vitale MA, Fruth KM, Rizzo M, Moran SL, Kakar S. Prosthetic Arthroplasty Versus Arthrodesis for Osteoarthritis and Posttraumatic Arthritis of the Index Finger Proximal Interphalangeal Joint. J Hand Surg Am. 2015 Oct. 40 (10):1937-48. [Medline]. Olivier LC, Gensigk F, Board TN, Kendoff D, Krehmeier U, Wolfhard U. Arthrodesis of the distal interphalangeal joint: description of a new technique and clinical follow-up at 2 years. Arch Orthop Trauma Surg. 2008 Mar. 128(3):307-11. [Medline]. Leibovic SJ. Instructional Course Lecture. Arthrodesis of the interphalangeal joints with headless compression screws. J Hand Surg Am. 2007 Sep. 32(7):1113-9. [Medline]. Uhl RL. Proximal interphalangeal joint arthrodesis using the tension band technique. J Hand Surg Am. 2007 Jul-Aug. 32(6):914-7. [Medline]. Lewis RC, Nordyke MD, Tenny JR. The tenon method of small joint arthrodesis in the hand. J Hand Surg Am. 1986 Jul. 11 (4):567-9. [Medline]. Murray PM, Linscheid RL, Cooney WP 3rd, Baker V, Heckman MG. Long-term outcomes of proximal interphalangeal joint surface replacement arthroplasty. J Bone Joint Surg Am. 2012 Jun 20. 94 (12):1120-8. [Medline]. Wagner ER, Luo TD, Houdek MT, Kor DJ, Moran SL, Rizzo M. Revision Proximal Interphalangeal Arthroplasty: An Outcome Analysis of 75 Consecutive Cases. J Hand Surg Am. 2015 Oct. 40 (10):1949-1955.e1. [Medline]. Dickson DR, Nuttall D, Watts AC, Talwalkar SC, Hayton M, Trail IA. Pyrocarbon Proximal Interphalangeal Joint Arthroplasty: Minimum Five-Year Follow-Up. J Hand Surg Am. 2015 Nov. 40 (11):2142-2148.e4. [Medline]. American Medical Association. Guides to the Evaluation of Permanent Impairment. 4th ed. Chicago, Ill: American Medical Association; 1993. Lateral radiographic view of the finger with an implant in place. Photograph depicting the degree of flexion in a hand at 10 weeks following surgery.